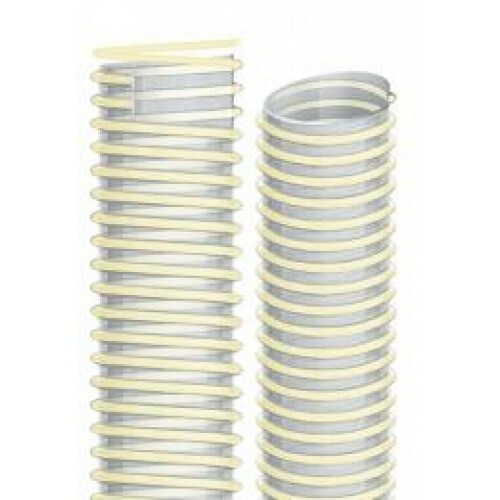 Technical Features: Ether based Polyurethane duct reinforced with an anti-shock rigid PVC spiral. Completely smooth inside, corrugated outside. Heavy duty product with a wall thickness from 1,2 to 2,0 mm. Properties: high mechanical properties, light and flexible, really good resistance to abrasion in heavy duty application, microbes, hydrolysis, ozone, weather conditions, UV rays, and chemicals. Halogens free conform to RoHS as well as free from phthalates or other plasticizers. Standards: Food grade according to FDA REg. Cfr 21-Item 17.2600 (acquous and fatty food) and to EU Reg. 10/2011, classes A, B, C, D2, REACH Regulation (1907/2006), TRB S 2153. Suction and delivery of alimentary products even fatty food and liquids. Not suitable milk or dairy products. Indicated for suction and transport of sugar, flour, grains and animal feeds etc.